It’s a media cliché by now to say that these insurgents were “too violent for al Qaeda.” That might be true, but it’s not because core al Qaeda flinches at the sight of blood. For the short term, ISIS is looking for territory; al Qaeda hasn’t stopped looking for targets. Yet with all eyes on ISIS’s warpath, we risk being distracted from al Qaeda’s very real efforts to launch the next major terror plot. Remember that al Qaeda in the Arabian Peninsula has demonstrated its intent to strike our homeland – and that its dangerously inventive bomb maker, Ibrahim al-Asiri, is still at large. Remember that al Qaeda in the Islamic Maghreb has made a point of targeting the interests and citizens of our European allies and that it still enjoys safe haven in Mali’s ungoverned north. These are threats that can’t drop off our radar, no matter how savage the destruction in Iraq and Syria. Of course, ISIS is generating new dangers day by day. First and foremost is the risk posed by foreign fighters. The regional war is radicalizing young men and women equipped with the deadliest weapon a terrorist can come by: a clean Western passport. In an especially perverse propaganda coup, ISIS’s rival, Al Nusra, is claiming credit for an American suicide bomber in Syria. This is a threat beyond what the Tsarnaev brothers inflicted on Boston last year. Those two allegedly learned their craft on the Internet; the fighters we face next will have practiced terror in a warzone. ISIS dreams of carving out for itself a neo-caliphate, plucked out of the 7th century and dropped without warning onto their modern victims. In practical terms, they’re creating a vacuum for terror to fill, and a training ground for the perpetrators of future international plots. We know that ISIS members are thinking westward, and thinking ahead to homecomings. Years ago, Abu Bakr al-Baghdadi reportedly quipped to his American captors that he would see them in New York; now, U.K. Prime Minister David Cameron is highlighting the threat posed by Britons who are fighting with ISIS. We know that Americans have gone to fight in Syria, and we also know – worryingly – that we don’t know where all of them are. We need to build better links with the communities these angry young people will be returning to. Better yet, we need to know to screen for them before they enter the country. Flagging individuals who would bring terror back home is an exceptionally difficult intelligence challenge, but it must be a top priority for our counterterrorism policy. 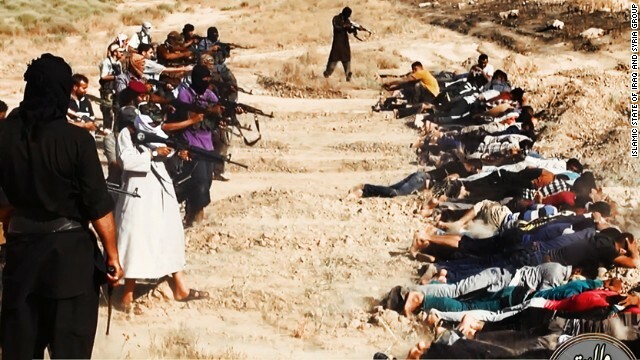 Whatever perspective you take on the subject, ISIS is a nightmare realized. We’re witnessing the latest convulsion in a regional war first unleashed by the barbarism of Abu Musab al-Zarqawi, with no end yet in sight. Iraqi soil has been practically scoured clean of what stability had been purchased by the blood and treasure of the United States and its allies. What’s left is a clear and present danger. We should be very cautious about Americanizing the conflict in Iraq and Syria, which would risk painting a target on our back, and I’m encouraged to see that our intelligence services are working with Jordan, Saudi Arabia, and Turkey to develop a better picture of the regional insurgency. An international effort – led by Arab nations taking responsibility for their regional security – is the surest way to contain the mass violence. Drones alone can’t deliver good governance to Iraq, and a more inclusive Iraqi politics led by someone other than al-Maliki is the only durable antidote to the country’s wasting insurgency. Even as we work to stabilize the region, we absolutely must keep in mind the end game. For al Qaeda and the rest of the transnational jihadist movement, the brass ring remains a major attack on Western soil. In Iraq and Syria, ISIS may crumble or it may conquer. Regardless, the chief responsibility must be to thwart plots that would put Americans in the cross hairs. Those may come from new foreign fighters radicalized today, tomorrow, and the next day – we can’t ignore that those threats might come too from old enemies who have never stopped planning for American deaths. In Boston, bombs went off because a pair of first-time terrorists got lucky. Going forward, we’ll face bombs that go off because their designers knew exactly what they were doing. Lol only 3 were mine. I got my sisters 2 when she was killed on 9/11 which is why i KNOW my mother wont ever come arount. Plus shes 87! Isn't it something chrissy? I mean your take on our government's stand on ISIS...kind of wishy washy that's for sure. I didn't know that. So so sorry about your sister. How heartbreaking. ..so kind of you to care for your sister's children. She would be so glad..I mean to know it is someone as nice as you..
My sister and i were very close and as her and my brother in law were in the military i had my niece and nephew most of the time already! They had already lost so much it wouldve been awful to take them out of their other home! Plus they were all good together, my children wouldve been lost without them also! Again. I am sorry for your loss. As for the US governments stand on ISIS...i think our POTUS is a wise man and he really cares about the citizens. He knows we are war weary plus he is a diplomatic kind of guy but CONGRESS...thats a whole different can of worms! Obama knows they will critisize whatever plan he comes up with just out of spite! Doesnt matter to them what the people want. Obama has been funding allies of the al Qaeda group al Nusra in Syria, and 'reached out' to the Islamic Front, the biggest group of rebels, who are Salafis, allied with al Nusra and share their desire to start a 7th century caliphate. The only thing that prevented him was they wouldn't agree to his conditions for association. He is on record of saying they are 'OK'. Obama, on the other hand, isn't OK. Yes, this is a 1500 year old problem. No Western state can fix this. Don't blame any one administration. This is purely a Middle East concoction. The West didn't get it when they set up false, self-serving boundries after WW1, and we still don't get it. I know it still has to hurt. At least memories are precious as well as priceless..no one can ever take that away from you chrissy. Thank you! I learned long ago you have to forgive to heal! And you cant blame a whole race for the actions of a few! My sister and i will be together again one day! Until then i plan on helping as many as i can and to do my very best to harm no one! Have a good nite and God Bless! You did yet another tremendously admirable thing by raising your sister's two children. Also, I am deeply sorry that you lost your sister in that horrible attack. And just think i did all that without having "to leave my intelligence at home while using my elegant heart!!!" Oops i got that wrong "left my brain at home while thinking with my elegant simplistic heart"
And for the record it wasnt exactly admirable! It was an act of love and it was also theraputic in helping ALL of us heal! The heart KNOWS what the heart knows! And sometimes that is far more intelligent than the brain! Thats why we have both! Did you see SUNSET BOULEVARD? SWANSON: I wrote that with my heart! HOLDEN: Sure. That's what makes it great. Lol as a matter of fact yes i did. Now you know that my "admirable act" was selfish though right? It helped me cope with the loss of my sister but also helped my kids as well as hers as well. The ISIS under its current leader Abu Bakr al Bagdadi appeals more to young foreigners than Al Qaeda chief, Ayman al-Zawahiri, who – a theologian – is nearly twice the age of al Bagdadi. The ISIS is loaded and can afford to recruit more foreigners. Most of those, who join the Jihadists are young Muslims born in the West. Some of them have lost their bearings and are misfits. Not all of them pose a security threat, when they return home, but the authorities don't want to take risk. In Britain, the Home Office had deprived those fighting in Syria, of their British nationality, to prevent them from entering the country. The Home Office has talked about depriving them of their nationality but it's not that simple, many of them will have been born in the UK or at least have had citizenship for a long time. Another problem is that they're not necessarily tracked on re-entry to the UK so it isn't always known if they return. It's a mess, they have been stating in Syria they do intend to bring the war back to Europe complete with their fighting experience gained there. I remember my son. Age 9 at the time of 9/11. Walked up to me and asked. "when will they attack us here dad..?" My answer was.? "Behind every cop.. Fireman.. Ambulance person.. And emergency responder. Is a country hick.. Father.. Mother.. Grandfather.. Anf family who WONT let it happen again son.!" God.. Guns.. And guts.. Made america free. And we WILL defend our families.. Homes.. And life. To prevent any oppression from that ungodly section of the world..! Our history should prove that back to 1776.. We may not have the perfect society. But it MICH BETTER than that alternitive by a huge margin! And I defended it. And will if asked again. Dont let the ones who paid the ultimate price. Be in vain..
Oh gees @ Isobel... Obama is NOT funding anything! Thats pure slander! ALL taxes and expenditures MUST be approved by Congress!!!! Its how it works, you may not like it that you cant blame the black muslim man but thats just how it is! Sad that no one can find a ligitament scandal to tag him with isnt it? Hardly fits the profile of what we are used to! Lol the REAL sad part is the way you all try to blame him for things that he OBVIOUSLY cant be responsible for!!! ISIS is a component of Al Qaeda. When we think of terrorism as American's we always think of dreaded day of 9/11 when innocent American's family's felt the pain, as they lost loved ones from the NYPD Police Department, NYPD Fire Department, NSA Agency also FBI terrorism unit of NY those brave men and women put their own lives on the line for their city and country, so the rest of us could enjoy life and liberty free from terrorism attacks on our soil. Terrorism is not a new thing for the Middle East it was started thirty years ago by a young women from Lebanon when her family was killed, it was about revenge not about religion or anything like terrorists claim today to the hateful videos they broadcast to the Western countries. So ISIS is just another radical spin of terrorists group from Al Quaeda, which just makes claims they are tied to them which not be the case atall. As an European American who has traveled to the Middle East and Israel before and seen the first hand devastation that terrorism play's in the lives of young Jewish and Arab men and women, who are college educated they denounce terrorists attacks which kill innocent men and women of all religiousness backgrounds. As Americans we need to start understanding about different terrorist groups, that harm our way of life in our great nation, which stands for freedom and liberty under the great Stars and Strips flag which allows all American's to live their lives free from any type of harassment of dangers to our lives. Without more American's doing more international traveling or having culture programs on terrorists groups on our local televisions, will we become a nation which is scared from all spin of and real terrorists groups for years to come. I used to love Fonseca Bin #29 port wine, in the US. What a shame you can't get it anymore. Taylor Fladgate bought them out, I believe..... can you still get Fonseca Port in Europe???? Islam is the biggest threat! Had prophet Mohammed been alive, he would've been the supreme leader of ALL radical and moderate Islamic groups in the world, in fact, he would've made it to the top FBI list as the most wanted criminal of this planet. To all haters of Cheney,Bush or republican party!! !Inaction in military terms or political ones like economics have led to 9/11!To people who are unaware, we actually don't live in a world of physics though physics and abstractions(ideas,emotions,spoken words)them both rule the actual world we live in as beings. Not taking care of Al-Quaeda since 1993 WTC failed bombing have led to 9/11!!U.S.S. Cole bombing of 1998 whom made 200 some deaths actually was a sign of what was coming! Inaction show weakness and let evil grow!Inaction as well weakness is provocative to evil doers!! LOL! !It's funny to see extreme liberals find a scapegoat like whether Cheney or Bush for Iraq war!! I much prefer Iraq war to 9/11!Attack on america was tied to Afghanistan war!! I'm dead serious ignorant lefties scapegoat Bush and Cheney for what's happening now! warmongers they bully by their own ignorance.Peace is and always be won and saved by some kind of wars. Just like Nazism, Islam is not a religion, it is a political movement. "Al-Qaeda is on the run."